Just over half way through and we are back in Maipu at the Posada de Cavieres just in time for harvest there are a few pictures below of our journey back up Argentina, much of it we did last year (with a few variations, including a side track to visit some dinosaurs) but this time in fabulous weather. The night before we arrived we camped at a wild camp by a dry river bed, that the first person staying there called the Pirate Camp (still no idea why). We stayed there twice last year and arrived just before the sun went down, but there were 2 cars there. Whilst we considered what to do a German couple in a VW Combi that were camped next to us in our last camp site at Malargue rolled up beside us and whilst we were chatting the people from the cars turned up and drove away. It was a little windy when we arrived, but once dark it was very still and quiet with an amazing display of stars. Then, in the middle of the night this incredible screeching started! We have no idea what it was but it sounded incredibly loud in the absolute silence. I've not heard anything like it since the Howler Monkeys in southern Mexico. That night certainly was dark and full of terrors. The Neuquen area is famous for the largest dinosaurs in the world being found within 20k of each other. Gigantosaurus, the largest carnivorous dinosaur, bigger than T Rex and Argentinasaurus (vegetarian) 40m long an over 100 tons in weight. But first we visited some dinosaur footprints on the beach. This was a model of Giganotisauru atthe entrance of the camp site we stayed at next to the museum. The museum was only small but very good as everything was in English. and in many cases had a model of what the dinosaur looked like next to the skeleton. This is one of the vertebra of Agentinosaurus. And this is the actual skeleton of Argentinosaurus - this was in a different museum about 30 miles away, unfortunately the museum was closed for renovation, but I managed to snap this through a window at the back of the building (after I had cleaned all the fingermarks off). A few shots of the scenery on the way up. This is the remains of a lava flow, all the black lumps are black lava. On the way we pulled in at a working salt flat, much smaller than Uyuni in Bolivia, but this one was still producing salt and they had a little museum showing the history (that's Chris in the distance). A couple of the machines that scraped off the salt between 1930 and 1955 (like snow ploughs). I was originally trying to work out how they were pedalled, but they were actuary pulled by horses. Then another detour along a canyon south of San Raphael. The Pirate Camp with the Combi. The arrival of the grape picker. An amazing machine that ran slowly along the vines and removed pretty much every grape but little else! Then it turned into a transformer and tipped all the grapes into a truck. About 4 hours and 2 large truck fulls of grapes later its all finished! No, its not raining. In fact the weather has been amazing since the last blog and if I plan the route right we should not get any rain for a while. The title relates to the cabin that Butch Cassidy and the Sundance Kid lived in for 2 years, after they fled from the US and took refuge with the Sundance Kids Girl Friend Etta Place in an attempt to settle down . Of Course, nothing escapes the intrepid Hodgetts! I found their hide-out - I was just 113 years too late! The Cabin is on the East Bank of the Rio Blanco, just north of the small town of Cholila (where we had an excellent steak and salad for lunch) in the Province of Cholila. It is not a tourist attraction (its completely deserted), but I think the plan is that it will be sometime.. There is a small tea shop/museum just before the cabin, but it was closed when we found it (according to the opening hours it should have been open). Not long after this we pull into a camp site and find the front left tyre is going down - and so begins the next saga! Next morning we pump up the tyre and find a repairer just along the road, but he soon finds it is not the tyre but a cracked wheel (the second one), the guy welds the wheel, all seems OK so off we go. On to El Bolson, the hops capital of Argentina, where 70% of the countries hops are grown, so understandably it is full of Cervecerias (pubs) - is the pope catholic! So we find a camp site within walking distance of the centre, put the tent up and walk to the centre, where there is a large drinking establishment with some excellent beer. There we meet up with an English couple that have been living in Australia for the last 30 years, have a few beers, then another amazing steak and a bottle of wine. Next morning the tyre is going down again, so we find another tyre place, the manager speaks good English and suggests using an inner tube. That done, we set off up the road and the wheel is vibrating badly, so we take it back to be balance. That sorted we decide to stay in El Bolson another night, but stay in a different, rather quirky site a bit further away. Next morning the tyre has gone down again! so back to the tyre place, where they find they caught the inner tube when fitting the tyre, so fit another one (more carefully this time) we decided to stay at the same campsite. Next morning the tyre hasn't gone down but the valve has almost disappeared inside the tyre, so back to the tyre place, they make a slightly bigger hole in the wheel so the valve fits in properly and off we go again. This time we really leave and so far the tyre has been fine! Before we left the camp site a German couple also staying told us of a pub in Bariloche that allows overlanders, excellent idea and also did good steaks. This cracked me up! The squawking bird followed the other one all around the huge camp site we were on for the 3 days we were there, fortunately the site was so big we were not able to hear them a lot of the time, but every so often would appear. Talk about hen pecked! Empty but not locked and looked in pretty good condition. And this is the area it is in. Haven't found many new road signs lately, but I did like this one. I think this is Jesus being tempted by the Devil, but I am not sure if he is pointing to heaven or making a more base suggestion! I think this angels wings were not big enough for him to fly so they had to give him a bike. There is a gap in the chest and steps up inside with another at the back of the head. This is the view from inside, it is not possible to see much through the glass as it is so dirty, but you can make out the face in the middle. And this is the walk up, it is just possible to make out the leg just below the top, but the contour of the hill prevents seeing the head from down here. Married in 1980 we had both travelled before we met. Me overland to India. Chris overland from Singapore, after working in New Zealand for 18 months and finally been given 24 hours to leave after repeated attempts to extend her visa. We both vowed to travel again, once we were able and whilst we have recently made short trips to Peru, Sri Lanka, Nepal(Mick) and Vietnam (Chris) this has simply fuelled our desire to travel (without having to rush round in 2 weeks). Then in August 2007, returning from Slovenia with our caravan, we met Jeff & Jean and was the first time we had seen a Landcruiser with a tent on the roof. Over a few beers they told us about their two trips to South Africa, down either side of the continent (see Gonewandering.co.uk) and their plans to ship the Landcruiser to the point of South America and drive to Alaska. So it was set! by the time we had left we had given ourselves 4 years t be on the Road to India and beyond. 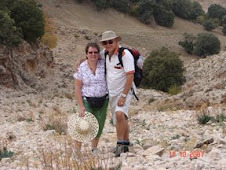 Then, in October 2007, we made a quick trip to Morocco for a last attempt to get some sun (after 2 wet weeks in Spain in April and a mostly wet caravan trip across Europe). Chris wanted to be intrepid and travel round by bus and Grand Taxi, but thinking this would soon fade, when we had to wait for hours, or have trouble finding accommodation, I hired a car instead. Ending up in the Hotel Panorama in Azrou (one of the few places we could get a beer during Ramadan) we met up with Dave and Sue (over a beer). They had hired a guide for a walk the following day and invited us to join them. Before starting, Dave confirmed the rules to the guide - no walking on roads and back by 4pm. It was an enjoyable walk until, at 4pm precisely, we arrived at a road, with a sign that said 'Azrou 4k'. After the toys had been firmly thrown from the pram Dave sat on the bank and said 'It's 4 o'clock, that's a road and I have finished'. As he said it, a Grand taxi stopped just down the road to drop someone off (or pick someone up, I'm not sure), our guide flagged it down and the driver promised to be back in 5 minutes.